The main reason bags are lost is damage to, or loss of, the standard airline baggage tag. These paper tags get torn off on conveyors, get wet, or get scuffed and damaged making it difficult or impossible to read. If your bag does not have any other identification on it, it may never come back. 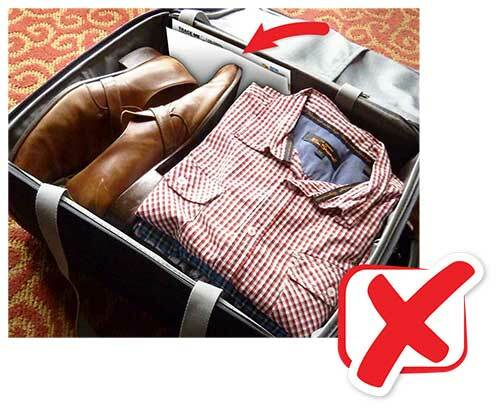 Airlines, Airports and Travel Experts will tell you that the best way to minimise the risk of losing your bag is to add clear and secure back-up ID inside and outside your bag. Your TRACE ME plastic tag already has the outside covered. So now add a TRACE ME Inside Bag ID Sheet to cover the inside. 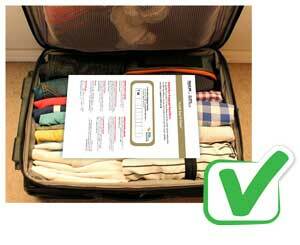 Write in your TRACE ME serial number and place it inside your bag, on top of your belongings, as shown below. Your bag now has TRACE ME protection inside and out.